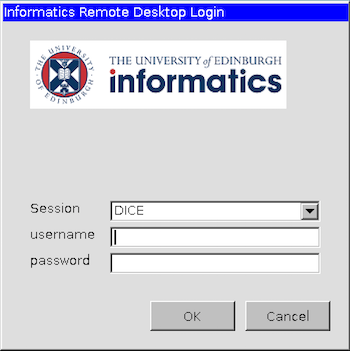 The Informatics Remote Desktop gives you a DICE graphical login, displaying on your computer. This page explains how to use the Remote Desktop service on a Mac. This involves installing the client, then configuring it, then connecting to DICE. Installing and configuring the client only have to be done once. First, install the free client software, Microsoft Remote Desktop. Either click the link above then select View in Mac App Store, or open App Store yourself then search for Microsoft Remote Desktop. Then click Get or Install to install it on your Mac. Start Microsoft Remote Desktop. You'll find it in the Applications folder or in Launchpad. Click + and choose Desktop. 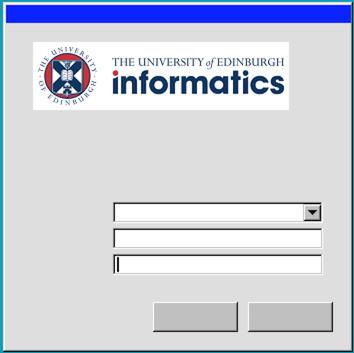 In the window that appears, enter xrdp.inf.ed.ac.uk in the PC name field. To use the staff, research postgrad, and visitor service, enter staff.xrdp.inf.ed.ac.uk instead. In Microsoft Remote Desktop, double-click the xrdp.inf.ed.ac.uk icon. In the User Account window, enter your DICE username and password then click Done. Your DICE session should start. If you have a slow connection, and your remote desktop responds slowly, try reducing the number of colours it uses. To do this, highlight the xrdp.inf.ed.ac.uk session icon then select Edit Desktop from the Connections menu. Click Display then change Color Quality from High (32 bit) to Medium (16 bit). New sessions should then run less slowly. Note that this problem may even prevent you from logging in if your DICE password contains symbols as well as letters and numbers, because symbols are often on different keys in different keyboard layouts, so your password will be typed in wrong. If this seems to be a problem for you, try logging in to DICE and changing your password to one without symbol characters. You may also see a blank box with one blank button on it. This is an error message, and if you click the button you'll then see the login screen as above. If you get this problem with the version 10 client, try using the version 8 client.